What are the stages of acne? How do we prevent getting Acne? Acne is a common skin condition which usually affects the face, neck, chest, and back. Acne is usually treatable, though sufferers may need treatment for several months. Most people with acne are aged between 12 and 25, but sometimes it can strike older and children too. The question how to treat acne widely depends upon the severity of acne which can range from mild to severe. Acne in adults is mostly caused by overactivity of the sebaceous glands in the skin. It is not infectious, so you cannot get it from another person. But it can be hereditary. That means the condition can pass through genes. Sebaceous glands under the skin surface make oil (sebum) which keeps skin supple. The sebum comes out through pores (tiny holes). Hormone changes especially at puberty stimulate the sebaceous glands and make more sebum. That is why acne is commonly seen in teenagers. When pores get blocked (by thickening of the skin and dead cells) and when sebum collects under these blocked pores pimples or acne occurs. There is a bacterium called Propionibacterium acne which is normally found in the skin. It multiplies in trapped sebum. Sometimes inflammation occurs making the surrounding skin red. The spots can get larger and fill with pus. 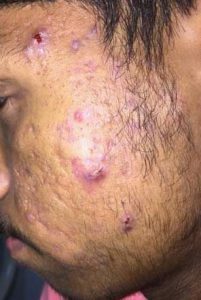 When several pustules are close by they can get larger and form nodules and cysts. These inflamed spots can heal with time but sometimes may leave a discolored area (hyperpigmentation). Scars can be left on the skin if cysts are ruptured. Cosmetics: when you use a new product or a product which doesn’t, you’re your skin, it starts to breakout and this is the kind of acne you get. It could be from makeup, sunscreen, products with ingredients that clog your pores, irritating fragrance from fabric softeners etc. Poor Cell Turnover Rate : when a dead skin cells are not being shed at the proper rate and contribute to pore blockage, it leads to acne. Disturbed Skin: When your skin is irritated (red, flaky, itchy, stingy) or overly dry, it can make you more vulnerable to p.acnes. With poor skin barrier function, your skin doesn’t do a good job protecting itself and keeping itself healthy. Underlying Health Problems: Underlying health problems can also cause acne. These include candida, thyroid problems, PCOS, diabetes, digestive imbalances, and metabolism issues. Stress, Lack of Sleep: Stress can wreak havoc on skin and worsen acne symptoms. But it isn’t so direct a cause of acne that every time you feel stressed, you instantly get a new pimple. The alternative, being stress-free, also doesn’t guarantee clear skin. Stress, however, is definitely something that can aggravate acne and make it worse. Toxin Build-Up: Toxins can build up in your body through constipation or poor liver/kidney/intestinal function. When this happens, the build up gets released through your skin, resulting in acne. Acne can be divided into 4 different grades depending on how it looks and its severity. The severity differs from one person to the other. Once you know what your acne looks like, it is easy to understand to which grade you are in and look for best acne treatment option. The treatment depends on the severity of acne. In the same individual, the grade of acne may change depending on the time of year, hormonal changes (such as during menstruation, during pregnancy or puberty), stress levels (during exams, crisis situations, break up or loss of a loved one) etc. So the Acne treatments too has to be changed for best output and effective results. Grade 1 Acne is the mildest of 4 acne types hence it also most commonly know as mild acne. 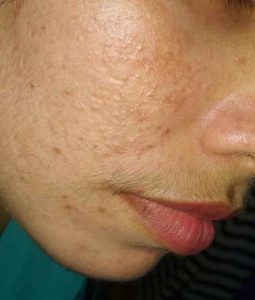 This Acne consists of comedones (blackheads) mostly on the nose, and a few papules which are small, red breakouts typically found on the cheeks. These breakouts are minimal and tend to be occasional. Apply an acne gel containing Azelaic acid or an OTC product which contains salicylic acid. These will gently exfoliate the skin, unblock the pores and prevent developing more blackheads. Steam inhalation twice or thrice a week will help to unclog the pores. Do not squeeze out the lesions with fingernails, as the skin can get damaged and cause inflammation and redness, which can also lead to infection and scarring. After steaming one can use a blackhead removal tool (Blackhead extractor) or a comedo-suction tool to remove blackheads. These tools are available over the counter. They should be used with caution. If done properly no scarring will occur. In moderate acne, there are more blemishes. Apart from the T zone area, lesions can occur anywhere in the face. The skin has several whiteheads which are also called closed comedones. They appear like raised white or yellowish dots. When squeezed white material will come out. Around a white head, there is surrounding redness due to mild inflammation and sometimes mild swelling of the area. Apart from whiteheads, there are papules (firm elevated reddish or skin colored bumps when felt feel rough and irregular) and pustules (small bump or blister filled with yellowish material /pus) which are also called pimples. Papules, when squeezed no fluid, will come out. Pustules when squeezed, yellow color pus will come out sometimes mixed with blood. Pus is an accumulation of skin debris, white blood cells, and bacteria. 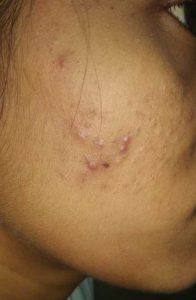 Grade 2 Acne will be difficult to treat than Grade 1 acne. However, you can try OTC products before seeking help. Try OTC treatment for about a month. Any treatment will take time to respond. If not responding or worsens with time it is better to seek help from a qualified medical practitioner. Inflammation is marked and there will be a lot of papules and pustules over the face. Since the lesions occur near to each other, it can spread and merge with each other and look like crops. This will lead to skin damage and even without squeezing, scarring can occur once healed. In severe acne, infection is deep within the skin. There will be more redness and mild swelling of the face. It is best to seek treatment from a dermatologist to control severe acne. Topical treatment is not enough here. The person needs oral antibiotics like a course of doxycycline or minocycline for about 3 months to control infection. For this, a prescription from a doctor is a must. However, you can keep your skin clean. Do not touch face unnecessarily and never squeeze or break pimples. This will lead to spread of infection and worsen the acne as the pus contains millions of bacteria. Medicated cleansers with oil control properties are necessary. Usually, dermatologists will prescribe topical antibiotic gels or retinoid gels or both to control the acne. Due to the antibiotic policies, gels containing antibiotics are not available as OTC products. This stage is very severe. The blemishes are large. They can occur not only on the face but neck, shoulders, back and sometimes arms. They are deep and firm to touch. There are cysts which look like a boil or a big blister. The size of a cyst may be about half a centimeter in diameter. They contain pus inside. There are also firm or hard bumps called nodules. They do not contain pus. When the face is touched, it may cause pain. Scarring is very common in Cystic acne as the lesions are deep. 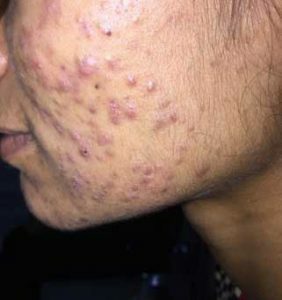 Cystic acne is difficult to treat and to achieve proper control. Even after good control, they can reappear again. As OTC medications are not adequate enough to control, and there is no point in trying home remedies. The patient must visit a dermatologist and may have to have regular follow up visits to achieve control and prevent further recurrence. Keep your skin clean always – cleanse face twice a day with medicated cleansers for oily skin. The doctor can prescribe a cleanser containing antibiotics or antiseptics. Use as instructed. Do not squeeze lesions or use scrubs to exfoliate your skin. The prescribed treatments include both topical and oral medications. Topical antibiotic gels, retinoid gels or combinations are used. Oral treatments include antibiotics like doxycycline or minocycline, anti-hormonal treatments or other oral drugs like spironolactone. The dermatologist will decide the ideal combination to prescribe and even change the medication depending on response. At least 3-6 months of treatment is necessary for proper control. So the person has to be patient and use the medication with good compliance. Steroid injections to nodules to reduce inflammation may be tried by the dermatologist. Acne can be cosmetically distressing to a person. Especially nodular cystic acne will cause problems with self-esteem. Severe acne is known to cause depression. Even with complete control, acne is a skin condition which can reappear. So always seek help when necessary. Acne treatment for sensitive skin may differ a little from the normal routine for acne treatment and one has to an extra care. Though it is little harder but can be controlled using proper instructions and persistent care. One should avoid harsh products that can be a scrub, exfoliates, Makeup product, Soap, etc. One should not try too many treatment products at once. Until you know how your skin reacts, introduce any new skin care product slowly and carefully. While trying a new product (a cream, gel etc.) start with allowing it on skin only for 5 minutes and then gradually increase the time as your skin gets adjusted to the product. Drink plenty of water and stay hydrated, dehydrated body signals the skin to produce oil to keep it moisturized. Keep your face clean wash at-least twice a day to remove impurities, dead skin cells, and extra oil from your skin’s surface. Avoid too much exposure to the sun as it may dehydrate your skin resulting in oil production. Carry an umbrella or wear sunscreen if you are heading out in sun. Don’t panic if you get a pimple – because that will only worsen the issue. Be patient with the treatment plan.